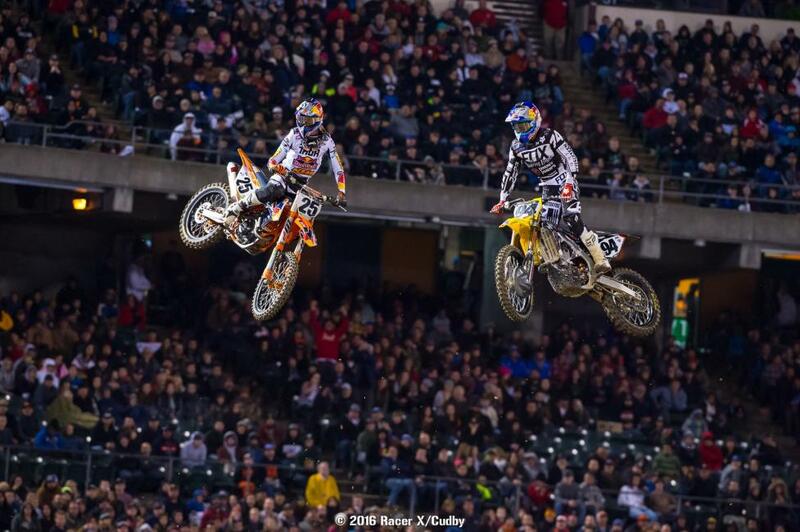 You know what the major story lines were coming into Oakland: Both Ryan Dungey and Cooper Webb were on rampages, and if the competition wanted to keep their title hopes alive they needed to put a stop to the orange and blue reign of terror. But with both Dungey and Webb riding so well, was that even possible? Check out the Race Day Feed below to find out. If you want the blow-by-blow from the very beginning of the day, start at the bottom and work your way up. If you're only interested in main event action, start directly below. 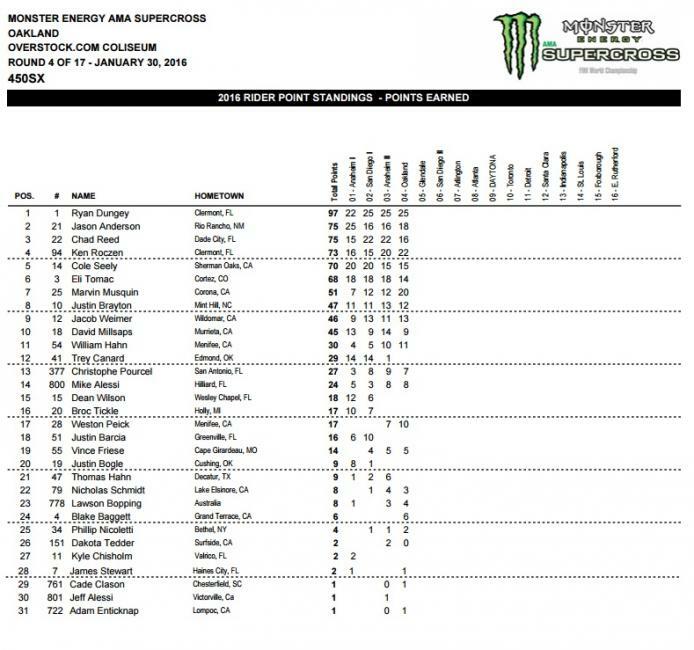 Ryan Dungey didn't get a good start...for about fifty feet. So he just tucked inside in turn one and literally passed around eight riders to emerge in the lead. Incredible. 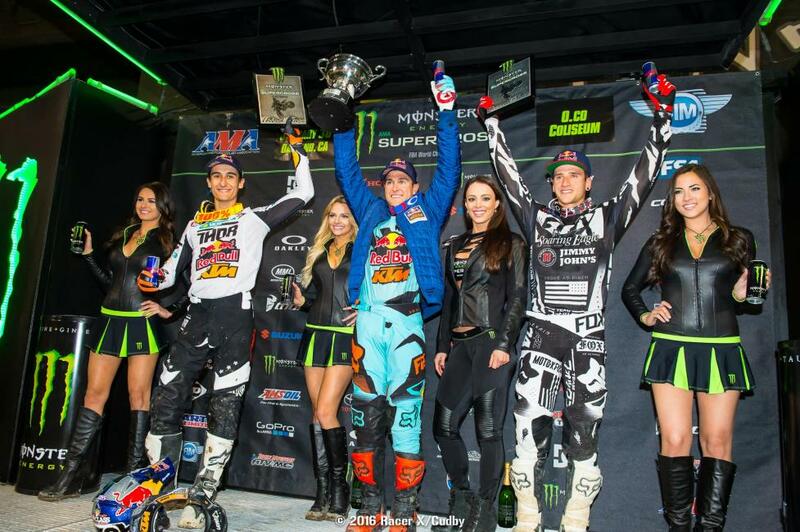 His teammate, Marvin Musquin, got his first good start of the season in second with Ken Roczen third. Roczen immediately started pressing Musquin for second in hopes of getting there before Dungey got away, but honestly it didn't matter because even after Roczen made the pass, Dungey just kept on motoring away inch by inch. When it was over, Dungey had his third-straight win. "I think about halfway through I needed some better lines, I switched it up about halfway through," said Roczen. "Ryan's riding really well, we're all trying hard and doing all that we can do. I feel like there were parts where I was strong, other parts where I wasn't." Musquin was third, his first 450SX podium. "This third is for the team, they all work so hard," said Musquin. "I've been trying to find my rhythm and try not to ride so tight, and working on my technique." Behind him a big race raged for fourth, with Cole Seely holding it most of the way with Chad Reed right behind, then Jason Anderson caught them. Anderson made passes on both, then Reed got Seely as well. James Stewart was quick early in his first race of the season, running fourth, but pulled into the mechanic's area at the halfway mark and called it a race. Eli Tomac started about 12th and rode steady to come through for seventh. Weston Peick was in good position, eighth, until the last lap when he crashed and failed to finish. But he was still credited with 11th since most of the riders behind him had been lapped. 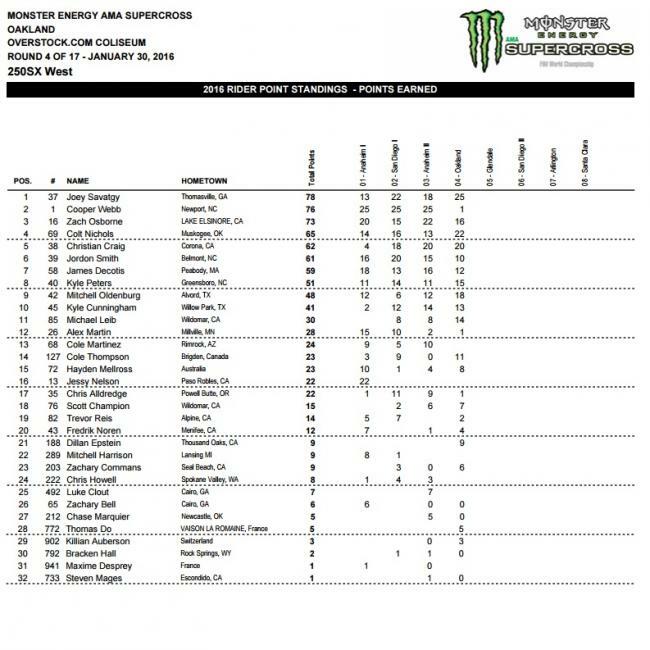 Jake Weimer Justin Brayton and Wil Hahn snagged top-ten finishes, as Davi Millsaps crashed on the final lap while trying to get Weimer for ninth. What a race! This one was just as exciting as last week’s 250 main, but for totally different reasons. Christian Craig got the holeshot with Cooper Webb right on his tail, and it looked like we were in for another game of cat and mouse. Only Webb seemed to back off a little, and Craig had a little bit of breathing room. But then he washed the front in a bowl turn and went down all by himself! He wasn’t the only one though, other guys were going down all over the place. Zach Osborne, Chris Alldredge, Hayden Mellross, and more all went down. 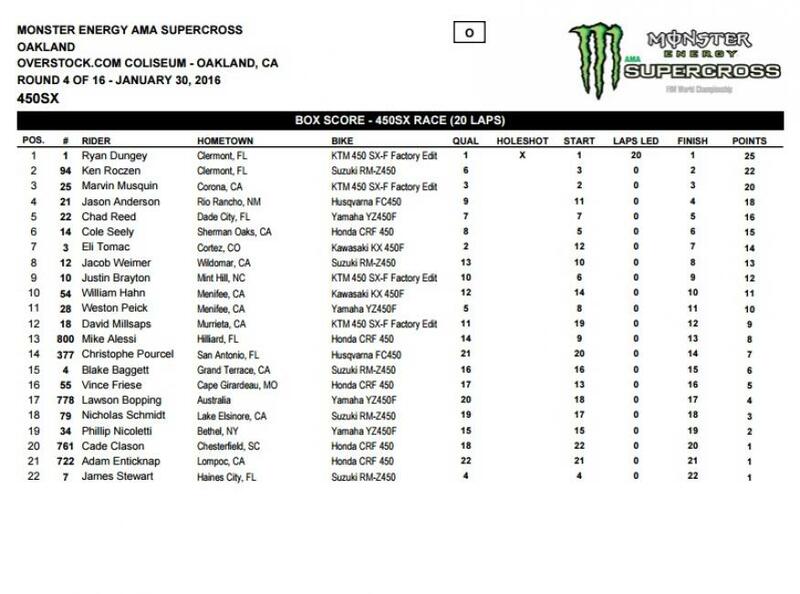 At this point Webb had control of the lead with Joey Savatgy close behind. A few spots back Colt Nichols was riding great and passed Jordon Smith for fourth. Smith then went down all by himself, and Alex Martin, who was in third, ended up crashing inside the over/under bridge. Martin tagged a tuff block just before entering the tunnel, causing the crash. Then, late in the race, Webb’s bike simply quit. Webb struggled to get it started, but it would not start and big puffs of smoke were coming out with each attempt. Several laps later he somehow got it fired but the damage was more than done and he took twenty-first, right in front of teammate Martin, who DNF’d after the crash. Savatgy took his first win of the season, with Nichols taking his first career podium in second. Craig rounded out the top three. Adam Enticknap busted out with a holeshot but Nick Schmidt took away the lead almost immediately. Schmidt took off and gapped everyone, while Tommy Hahn and Christophe Pourcel had to work their way up after mediocre starts. There was a major fight for the last spot on the final lap that went all the way to the end. Lawson Bopping, Pourcel, Enticknap, and Hahn were all so close they were right next to each other in the air over jumps. Somehow Hahn found himself on the tail end of the group, and attempted a couple of aggressive moves on Enticknap in the final two turns. Enticknap hung tough though, and was credited with the spot when he and Hahn both came over the finish line seemingly side by side. Jake Weimer holeshot this on his new RCH ride but Jason Anderson and Davi Millsaps were right there. A lap into it Anderson took over the lead and the battle for third between Millsaps and Weimer started heating up. 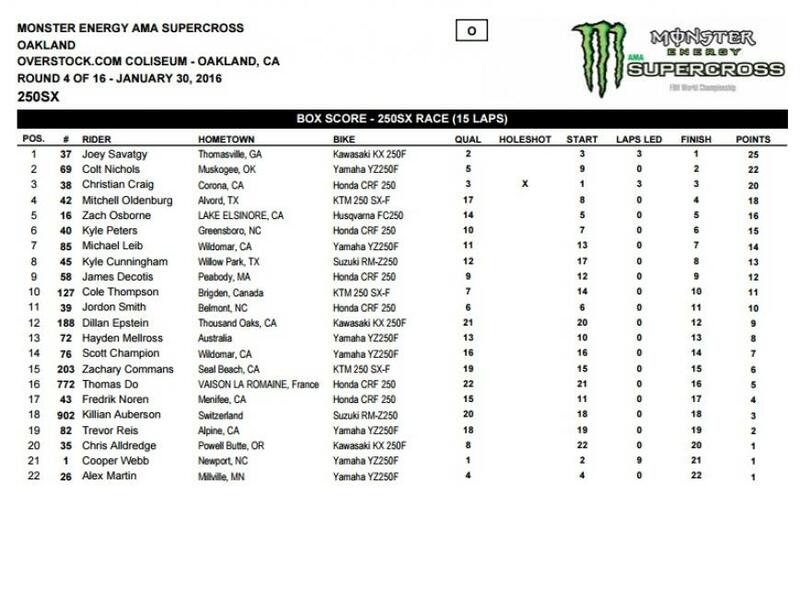 The two bumped slightly in the air through a rhythm lane and Millsaps came out with second. Phil Nicoletti rode to a lonely fourth and Vince Friese filled the final transfer spot in fifth. It looked like Mike Alessi pulled the holeshot in this one but Justin Brayton quickly got around into the lead, with Wil Hahn also getting around Alessi about a lap later. The top three rode to a lonely finish, with Blake Baggett getting around Cade Clason on the final lap for fourth. Cason still took the final transfer spot. Christophe Pourcel went down on the first lap and was forced to go to the LCQ. Austin Politelli and Cole Martinez both went down on the start, with Martinez getting wrapped up with a Tuff Block. Up front it was Zach Commans leading Killian Auberson, with Dillian Epstein and Thomas Do holding onto the final transfer spots. That’s how it ended too. Credit to Martinez, who got up from way back and charged hard, but he just ran out of time and took seventh. Ryan Dungey grabbed the holeshot in this one and disappeared in a hurry. 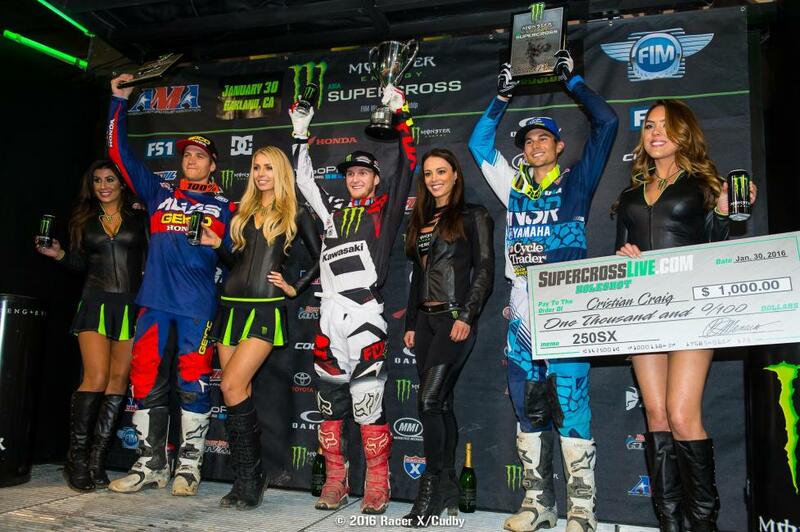 Way behind him was Marvin Musquin, and behind him were Vince Friese and Weston Peick. The two battled for a little while, and when Friese went high in a bowl turn Peick dove in, gave him a little tap (which put Friese on the ground) and took off with the spot. Chad Reed filled the final transfer spot in fourth. Fantastic racing in the first 450 heat of the night. James Stewart snuck around the inside to take the holeshot, tripled through the rhythm lane, and tried to make a break for it. But then nearly two laps into it Mike Alessi put a move on Stewart and went by, only to see Stewart take the spot right back in the next corner. Eli Tomac then joined the fun by getting around Alessi and started pressuring Stewart. Tomac made a serious bid for the lead down a straightaway and the two even bumped in the turn right before a big double, but Stewart held on. 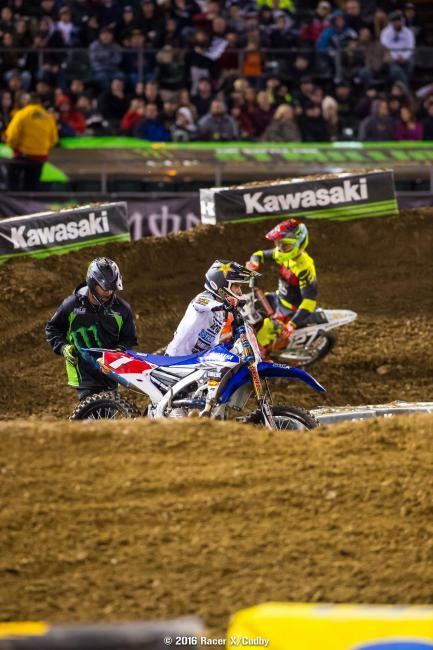 Amidst the fray up front Ken Roczen had managed to sneak up on Tomac and Stewart and was right there too. Tomac put in another attack, passed Stewart, then Stewart dove back inside and passed him back. Then Tomac came right back with another pass! 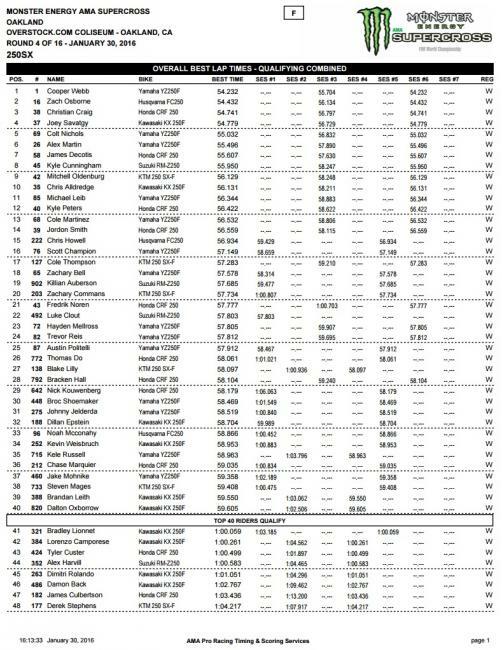 Tomac won, and Stewart and Roczen came over the line at about the same time with Stewart getting the nod. Cole Seely and Jason Anderson were battling for the final transfer spot, and when Anderson got by Seely it looked like it was over. But then Seely came back, put a good hit on Anderson and edged him out for the final spot. Tomac, Stewart, Roczen, and Seely all transferred. Christian Craig came out with the early lead in this one but Cooper Webb was right on him. No cat and mouse this time around, Webb just waited for the right moment on lap three, came in hot, and put a solid block pass on Craig, leaving Craig no chance at retaliation. From there Webb Gapped Craig and took off for the win. Back in ninth Cole Martinez and Mitch Oldenburg were set to battle it out for the final transfer spot but Oldenburg put a hard pass on Martinez that sent him up into the Tuff Blocks. Martinez nearly saved it but ended up going down as he tried to roll back down the berm. Webb, Craig, Colt Nichols, Cole Thompson, Jimmy Decotis, Michael Leib, Hayden Mellross, Fredrik Noren, and Oldenburg went on to the main. GEICO Honda’s Jordon Smith got the night going with a holeshot, but after leading for a few laps Joey Savatgy was able to get by, with Alex Martin quickly following. Martin looked good, and he didn’t let Savatgy check out, although Savatgy went to take the win. Zach Osborne went down on the first lap but fought his way back to seventh. Savatgy, Martin, Smith, Chris Alldredge, Kyle Peters, Kyle Cunningham, Zach Osborne, Scott Champion, and Trevor Reis all transferred. Trey Canard, who cut his hand last week, will sit tonight out after riding both practices with stitches still in his hand. His hand swelled up, leaving him with very little strength and it simply wasn't safe for him to race. CycleTrader.com Rock River Yamaha’s Colt Nichols got the final 250 qualifying session underway by setting the fastest time, which held up for what seemed like about half the session. That’s impressive since these sessions were five minutes longer than normal to help make up for cutting untimed practice. Joey Savatgy finally set a faster lap than Nichols, with Cooper Webb eventually taking control. Zach Osborne had a hard crash in a rhythm lane in this one and laid on the dirt for several moments before getting up again. Credit to him for getting back up and rejoining the qualifier. Luke Clout also had a big crash in the 250B session, prompting a red flag, and was hauled off in the Asterisk Medical Mule. 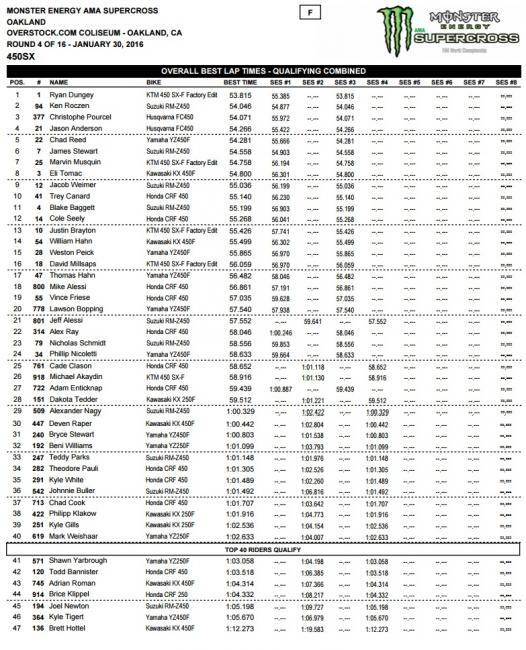 Not a whole lot went on in the final 450 session. The Suzuki’s of James Stewart and Ken Roczen battled it out for the fastest lap, going back and forth several times, but then Ryan Dungey threw down a heater that was significantly faster than both of them. Eli Tomac seemed to be searching for a setting out there, trying time after time to get a fast lap in and pulling into the mechanic’s area for adjustments after each unsuccessful attempt. Christophe Pourcel attempted his signature fast lap near the end of the session, and it was good, putting him in third. The track is breaking down quickly and big ruts are popping up everywhere so we should see a different style of racing on tonight’s treacherous racing surface. Buckle up, round four should be good. The first round of practices are over here in Oakland and there really weren’t any surprises. 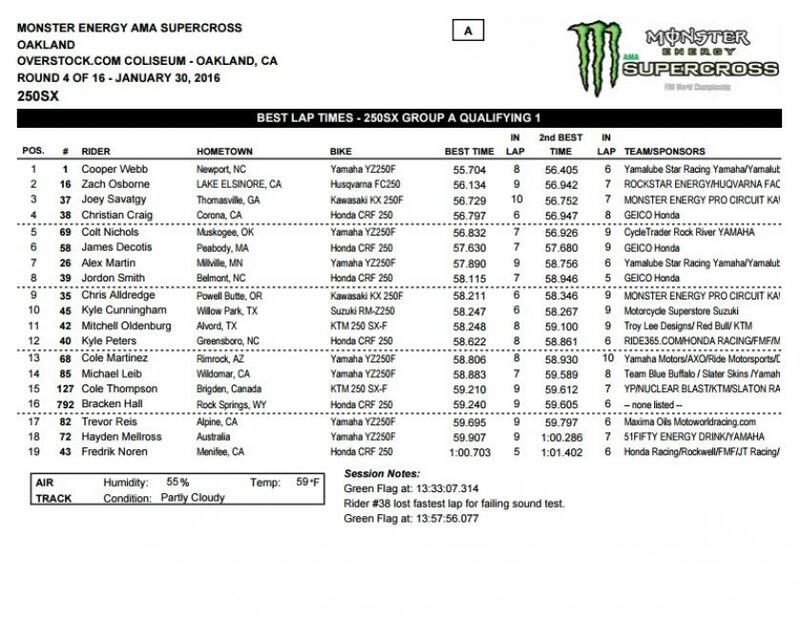 Since untimed practice was eliminated to give the track crew more time to work on the wet dirt it took a little longer for the fastest laps to start coming but when they did it was obvious Cooper Webb is once again, on his game. Christian Craig, who had his fastest lap deleted for exceeding sound limits, was fast too, spending a short amount of time with the fastest lap, but it wasn’t long before Webb took it back and held it for the rest of the session. Scary moment for Jordon Smith when Fredrik Noren went down on the exit of the whoops. Smith was blitzing them and had nowhere to go and ran over Noren’s bike, launched off the berm, and nearly landed on a camera crane, which has since been relocated. Fortunately Smith got back up and looked to be okay and got going again after a quick stop in the mechanic’s area. 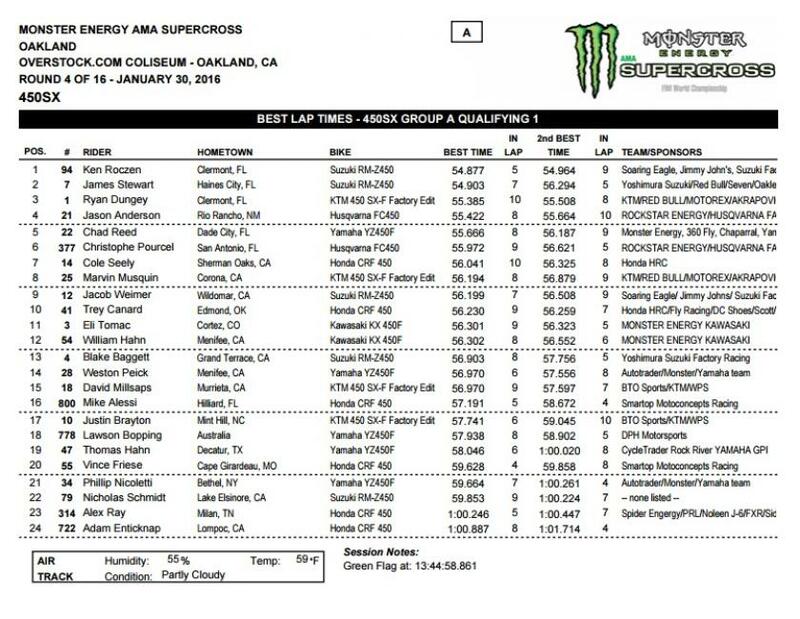 In 450 action a ton of guys were taking turns laying down the fastest lap as they learned the track—Eli Tomac, James Stewart, Ryan Dungey, and Ken Roczen were all at the top at one point or another. Ken Roczen finally took control though when he dipped down into the 54-second range and ended up fastest. The dirt looks soft and it looked like it was rutting up rather quickly, and when Christian Craig joined us in the press box for the second half of the 450 qualifier he confirmed that the track is indeed sketchy. And that was just after a few practice sessions! It’s going to get gnarly in tonight’s mains. Plenty to talk about this morning, first and foremost being the weather. It’s nice and sunny and the weather forecast isn’t calling for any rain, but plenty of it fell during the week, including last night. There was a fair amount of standing water when the track crew pulled the plastic off the track this morning, but don’t expect that to carry through to the night show—The Dirt Wurx crew are masters when it comes to getting a wet track in shape. Still, there was enough moisture out there to prompt the decision to revise the schedule and eliminate untimed practices, which means riders will jump straight into qualifying this afternoon. On the injury front we’ve got James Stewart and Blake Baggett coming back to racing while Dean Wilson will miss the rest of the season after having surgery to repair knee damage suffered last weekend. Bummer for Wilson and a bummer for the series. Elsewhere, Trey Canard is scheduled to race today after cutting his hand last week in Anaheim. The cut required stitches, which were originally scheduled to come out either last night or this morning. Well, they're still in at the moment, and we were told by the team this morning he's going to have them looked at and may just leave them in. The track itself is interesting. 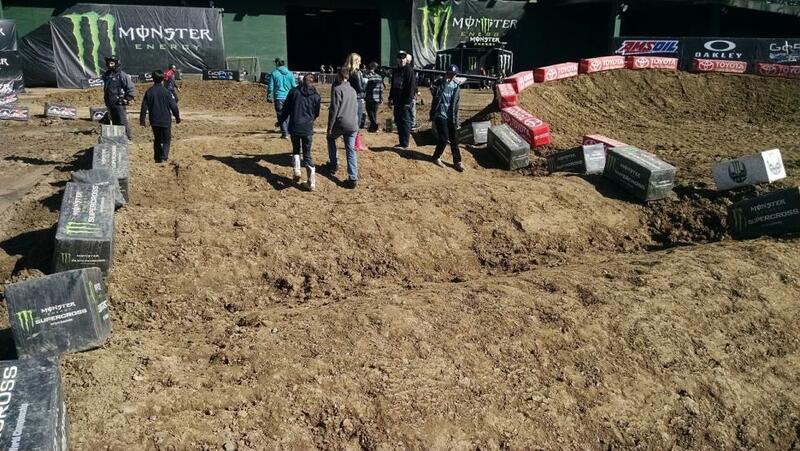 The start stretch looks a little shorter than normal, and there’s a small berm built up the guys will be able to use to get through the first turn. 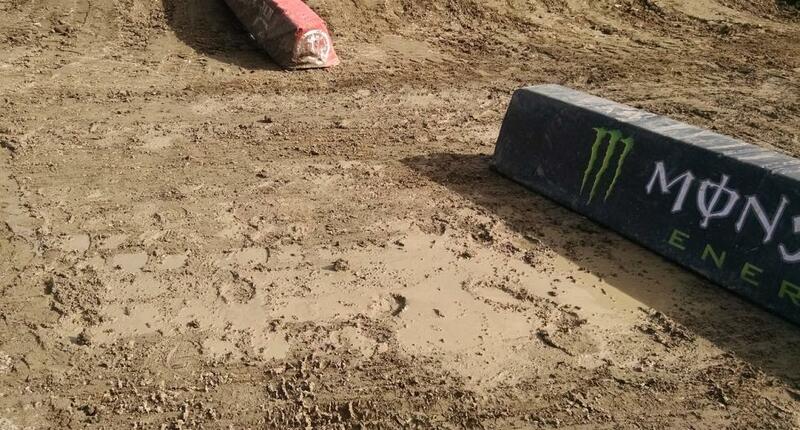 But when they complete a lap and come back around, that berm becomes a single. It’s curved, so guys on the inside will hit it at a different time than guys on the outside. It’s going to be interesting to see what happens here once qualifying starts. There are multiple rhythm lanes, none of them especially long, and a pair of whoop sections. One of them immediately follows a steep jump, and neither one looks very big. They aren't miniature by any means, but laset week's were much bigger. The dirt here is typically a little softer than what the guys have seen so far, and with the added moisture, it’s bound to break down and get pretty rutty and technical during the mains. We’ll see if that helps or hinders Ryan Dungey in his quest to extend his thirteen-point lead over Chad Reed.